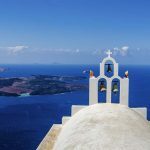 When we think of the Cycladic islands, our minds immediately travel to deep crystal clear waters, breathtaking views and whitewashed cobbled streets… But then there’s a complete different imagery: that of ‘Easter in the Cyclades’. Images of blooming countryside and spring wildflowers, traditional millhouses, medieval castles and the blue sea; picturesque villages with traditional Easter customs, the scent of myrrh and people quietly accompanying the epitaph by the sea. Do not waste any time! Choose a destination, pack your luggage and set off for an unforgettable Easter holiday in the Aegean. What better than celebrating the arrival of spring, the end of winter and the miracle of Resurrection in the most beautiful islands of the Cyclades? 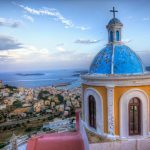 In the noble island of Syros, the celebration of Easter is a unique mystical life experience. 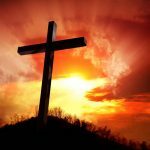 On this island-model of unity and brotherhood between the faithful of its two religious communities, Easter is simultaneously celebrated by Orthodox and Catholics – with a special permission of by the Pope – as a symbol of unity and love. On Holy Friday the Epitaphs from Ano Syros and the churches of Ermoupolis gather in Miaoulis Square. Locals and visitors watch from the stairs of the Town Hall and chant along with the Municipality’s Philharmonic Orchestra and the choir of Saint Nicholas the hymns of the day. On the evening of Holy Saturday, the joyful message of the Resurrection of the Lord echoes all over the island, and the sky of Syros is lit by fireworks. In cosmopolitan Mykonos, Easter sets the tone for the beginning of the tourist season as it is the forerunner of the summer. In Mykonos, the locals prepare for the arrival of the visitors: the alleys are whitewashed, the shops are renewing their merchandise and the houses get a fresh coat of paint to welcome the most beautiful time of the year. The spring scents from the blooming balconies and the sea breeze of the old port accompany all this work: a sign that the island begins to live again in its intense rhythms. The ships arrive at the new port full of people eager to be lost in the maze of Chora and while the newly arrived visitors go to Matogiannia or take pictures of the mills and Little Venice, the locals make lazarakia, human-shaped cookies, dye red eggs and bake cross-shaped bread. On Holy Friday, people accompany the three Epitaphs of Chora (from the churches of Saint Kyriaki, Panachrantos and the Metropolis) who gather in Gialos, while on the evening of the Holy Saturday they ascend to Ano Mera to listen to the hymn of the Risen Christ in the Monastery of Paleokastro. The next day, you’ll find traditional spits set in the Ano Mera square and the feast begins with folk songs and mykonian delicacies, like lamb, red eggs, cold cuts and local cheese. And as the Easter celebrations come to an end, the burning of Judas in Chora begins. 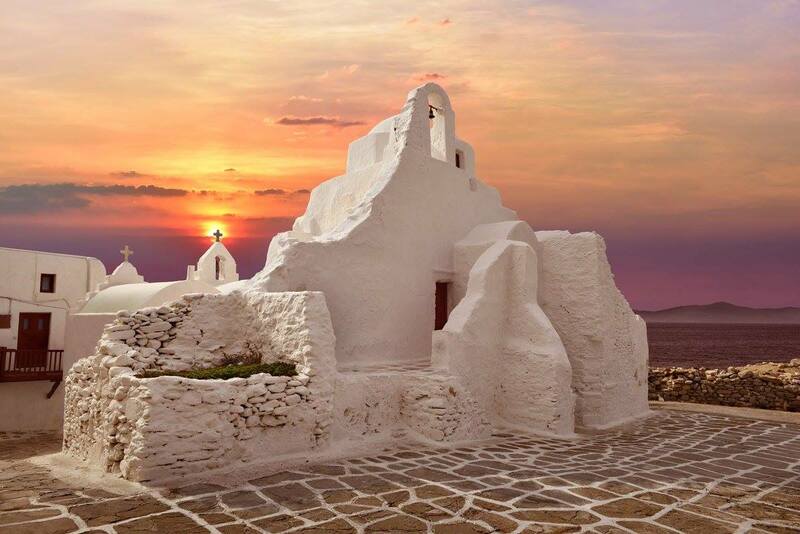 If you choose to spend Easter in Paros, it will surely be unforgettable. Especially if you leave the capital of Parikia and the picturesque fishing harbor of Naoussa for a while, and choose to get to Marpissa. On Holy Friday, the village fills with people eager to watch the Lord’s Passions, a custom held since 1937. During the Epitaph procession, people of all ages dress up as Christ ‘s students or Romans soldiers, representing in the most theatrical way the Resurrection of Lazarus, the Last Supper, the Calvary Ascending, and the Crucifixion. In recent years similar representations have taken place in the villages of Lefkes, Prodromos and Marmara. 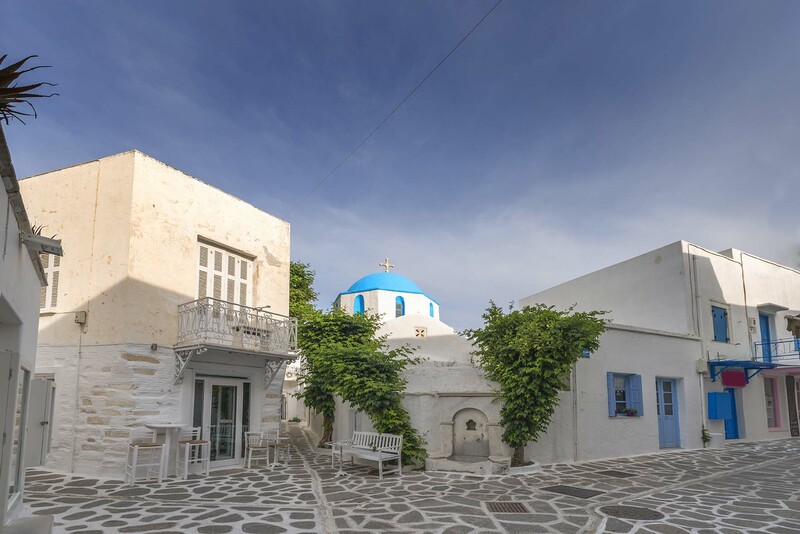 In the green and picturesque villages of Naxos, Easter celebrated traditionally and has a scent of older times, while the roots of the Easter customs that have prevailed to our day are lost in the depths of the ages. 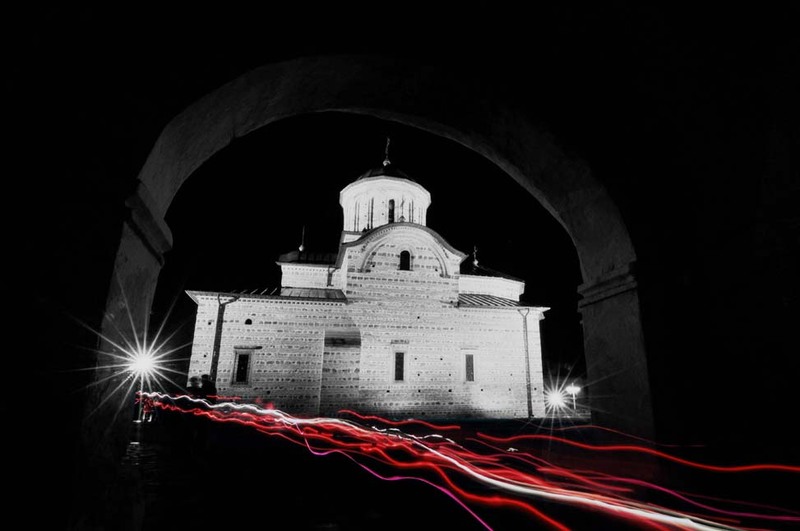 According to tradition, the nuns of Moni village made and gifted bread rolls with raisins and walnuts on Holy Friday during the time of Contantine the Great. The custom is preserved until our days, and on this particular one you will find a busy bakery, full of bread rolls with nuts, that are taken to the Byzantine church of Panagia Drosiani to be blessed by the priest and after the Descend from the cross, they are usually enjoyed alongside local raki. Moving to Kastraki, you will see the most breathtaking epitaph procession with the Aegean blue in the background. Made of sea wood and adorned with little flowers from the fields of Naxos, the simple Epitaph from the seaside chapel of Saint Gregorousa enters the sea, causing awe and a thrill of emotion to the believers who accompany him. In Engares, a crowned Christ wanders among lit canes put in various points of the village by young people. In Apeiranthos it has long been believed that light and noise can drive away the evil spirits. 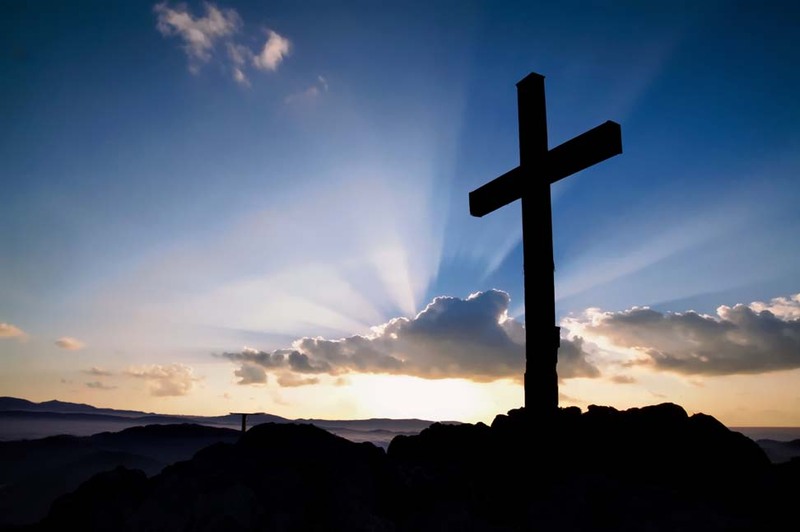 Therefore, the evening of the Resurrection could not but be radiant and noisy with fireworks, the joyful ringing of the church bells, the lighted vines outside the church that enhance the resurfacing light and the steady voices of the young people who chant the ‘Risen Christ’. Next, the festivities continue with a delicious spread: patoudo: goat meat stuffed with rice, raisins, greens and plenty of herbs roasted in the oven with potatoes; traditional desserts and plenty of raki. 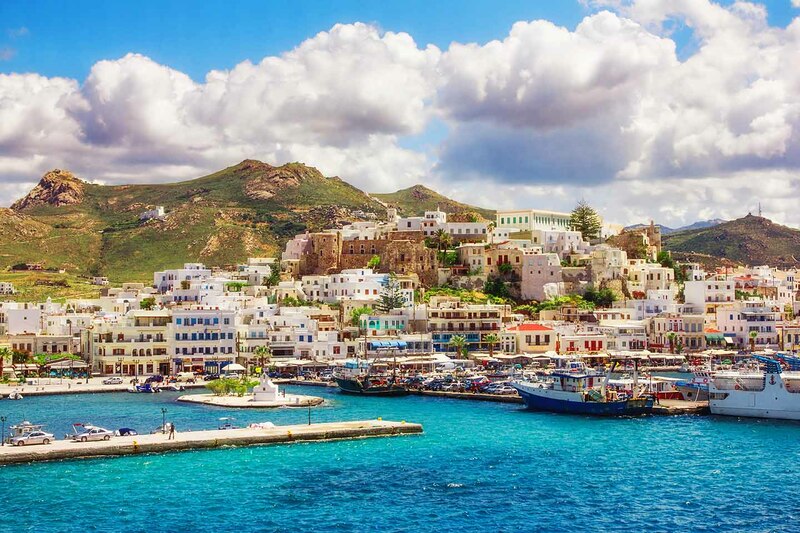 Apart from the 52 picturesque villages, the quiet beaches and the largest pilgrimage in the Aegean, the Easter period is another reason to visit the island of Panagia. On Holy Tuesday, the housewives of the island prepare traditional cheese pies, lychnaraki, the traditional Easter dessert made with petroma (a local unsalted cheese), sugar, eggs and orange. The filling gets wrapped in phyllo and a toothpick is used to make it look like a flower. Its unrivaled taste makes all this intricate work utterly worth it. 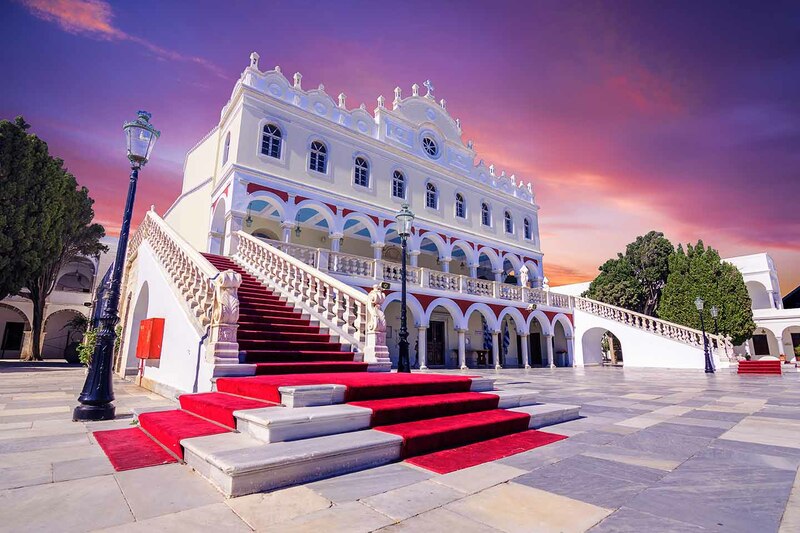 On Holy Friday, you are bound to enjoy a pay a visit to Pyrgos and see the epitaph on the illuminated narrow streets of the «marble» village, take in the scents of myrrh and rose petals that women bedew from the balconies. 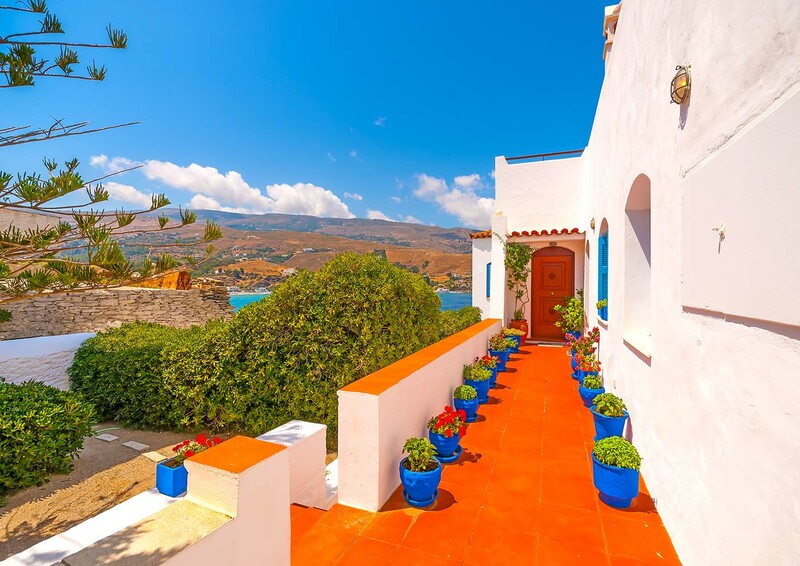 Alternatively, you can stay in the city of Tinos to admire a magical sight. All the Epitaphs meet on the marble platform of Chora, where the hymns are being chanted, followed by Saint Nicholas’ Epitaph that gets directed to the beach of Kalamia or Spitalia and is led into the sea along by the priest and the Deputy, as an honour for the sailors and a symbolic memorial service for all those who’ve suffered at sea. Boats with lit torches accompany the procession, flares illuminate the sky of Tinos and just across the rocky island of Chandra, three big crosses are ignited, creating a marvelous scenery. More Easter customs continue on Easter Sunday at the villages of Steni, Tarabados, Kardiani and Pyrgos. Old traditional unarmed weapons that pass from one generation to the next, are filled with gunpowder from the front, and get lit up to create a distinctive thud that is echoed all over the island. Aristocratic and noble, Andros is usually presenting a more calm and charming profile. However, Easter is quite different, with and equally loud to the island of Chios! 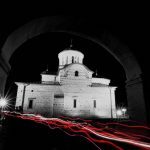 On the night of the Resurrection, the sky of Andros is filled with fireworks, called smpara, while the parishes compete for the most impressive and noisy scenery. On Easter Sunday a special custom takes place in Stenies; young people place iron pipes in the soil, fill them with gunpowder and fire them, starting a powerful gunpowder-war that echoes the whole island, the so-called maskula. And though lamb on the spit is more common across Greece, locals prefer to roast theirs in wood burning ovens, stuffed with cheese, liver, rice and a lot of herbs. At the south-eastern edge of the Cyclades, Anafi radiates tranquility, unlike the neighbouring bustling Santorini. During the holy days of Easter the island seems to turn back the clock. On Holy Saturday morning, local housewives of bakers knead the traditional cheese pie, a yellow bread made with Anafi’s saffron and local cheese, and in the afternoon they burn vine wood to prepare the improvised, open-air oven. Magiritsa is not a very common dish in Αnafi and the locals usually make goat meat with local cheese that goes in the baking pan, is covered with aluminum foil and put in the hermetically sealed ‘oven’ where it is baked for about six hours. On Easter Sunday afternoon, after the service and the procession of the icon of the Resurrection in the square of Saint Nikolaos in Chora, the inhabitants share sweets in memory of the loved ones who have passed. Ios, the land of endless partying, welcomes Easter in a special and quaint manner. On Holy Friday, young people play an old-fashioned game of ‘Balls’; as the name of the custom clearly indicates, this is a game of iron red and green balls. Women’s choirs chant the hymns of the day and accompany the island’s epitaphs, while on Easter Sunday the locals set up spits and the feast begins with plenty of wine and dancing in the center of Chora. Another custom that has prevailed until now is that of the ‘Kounia’, according to which the island’s girls dress in traditional costumes and sing from the makeshift swings while the boys are pushing the swings. 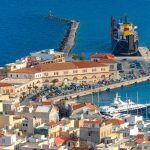 Thanks to its family-friendly character and close proximity to Athens, Kythnos is an ideal destination for Easter. In the little island with the classic Cycladic beauty and the wonderful beaches, customs and traditions are well kept. It is common for the people who have lost a loved one recently to bring ‘sychorio’ to church on Holy Saturday evening: it is a dish of roast meat, bread and wine that has been blessed by the priest before being offered to guests. On Easter Sunday, it is customary for the local young men and women to get on makeshift swings set up in the villages’ squares and promise marriage to their loved ones.